The goal and inspiration behind this group is to create stylized shoots for Alberta Photographers that provide an environment where we can bring in a small group of photographer who are looking to build their portfolio with incredible images, grow their vendor connections and connect with other rad photographers within the industry! These styled shoots are geared towards adding amazing images into your portfolio - whether you're just starting out and want to build your portfolio or you're a seasoned photographer who wants to add diversity and more amazing images to your work. it is not a workshop, but simply a time where people can shoot, to allow you room to get the shots you really want plus every photographer will have the opportunity to shoot and direct the couple themselves. We are; however happy to answer any questions you might have or make suggestions if you would like! The shoots will all be located in the Alberta, Canada area! Click the link saying "book now" for the shoot you are interested in. That’s it! Can a “newer” photographer come to these shoot? Of course! These shoots are for anyone who wants to come and take beautiful photos to build their portfolio! All styled shoots can be used in your personal portfolios, websites, social media etc. We also encourage you to share your photos with all vendors involved in the shoots and it is also a great way to build vendor relationships! 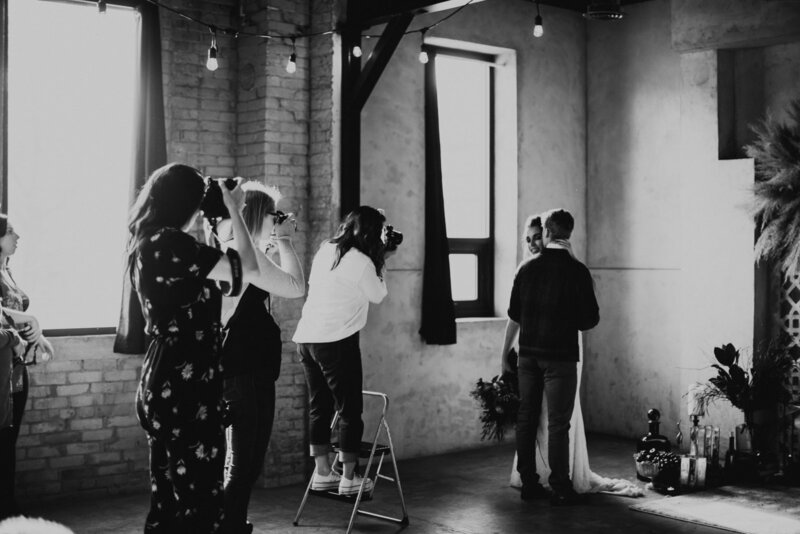 There are many costs to putting together a styled shoot; from buying an assortment of props, paying for dress rental or dress cleaning, as well as helping contribute to vendors costs to make it possible for them to come. It also takes a lot of time to coordinate these shoots so that photographers can just come and enjoy and get to shoot without the stress of putting it all together. 10 spots will be available in the morning and 10 spots will be available in the afternoon. This allows for small intimate groups; just the way we like it! Everyone will be broken up into 2 groups of 5 so there will never be more than 5 people shooting at a time in your group. Everyone will have 10 minutes to direct each styled shoot and be able to second shoot the entire time. transferable to another photographer if you need to cancel.